RonSwanson wrote: I have a 35 mile commute each way in a hot climate. Guess I can cross this one off my list! In your situation, I would only lease, 2 yrs, and for less than $200/mo. Right now we don't know how long the 40 KWh 2018 battery will last, but if the 30KWh 2017 battery is any indication, you will have difficulties making 70 mi after 2-3 yrs. Unless you're able or willing to charge at work or along the way, be prepared for significant degradation. I hope for Nissan's sake (and EVs in general), but at this point it's "Fool me thrice.....". You think there will be more than 50% degradation in 2-3 years? Holy crap. Based on some bad firmware. Reddy wrote: In your situation, I would only lease, 2 yrs, and for less than $200/mo. Right now we don't know how long the 40 KWh 2018 battery will last, but if the 30KWh 2017 battery is any indication, you will have difficulties making 70 mi after 2-3 yrs. Unless you're able or willing to charge at work or along the way, be prepared for significant degradation. I hope for Nissan's sake (and EVs in general), but at this point it's "Fool me thrice.....". Lovely picture, Too bad there isn't any real data to back it up. Please note the caption "30 KWH predicted". Until we have real world data over a year or so, we have no idea how the firmware change really affects battery life. This is especially true since Nissan hasn't released any details over what the problem was or how it was fixed. Just "trust us, we took care of it" from Nissan. Even this much had to be reverse engineered by the guys in New Zealand and they only did it because Nissan won't support the Leaf there. johnlocke wrote: Lovely picture, Too bad there isn't any real data to back it up. Please note the caption "30 KWH predicted". Until we have real world data over a year or so, we have no idea how the firmware change really affects battery life. This is especially true since Nissan hasn't released any details over what the problem was or how it was fixed. Just "trust us, we took care of it" from Nissan. Even this much had to be reverse engineered by the guys in New Zealand and they only did it because Nissan won't support the Leaf there. There is no real data that I've seen to suggest that 30 kWh batteries are really failing faster than expected. There is dynamo tests, range tests and recharge tests showing that at some the tested batteries are doing OK.. 2 years into their life. Remember that the test of time... requires time. Do read the articles behind the picture. Do read the text behind the caption. Do notice that they tested cars, getting real world data, not just "trusted Nissan". Do notice that Nissan will now provide this firmware update in New Zealand, which sounds like at least limited support for the Leaf. I expect rather than just telling me you don't trust Nissan, someone might find some more actual data based on physical measurements. Not BMS estimates. Not FUD from Tesla fanboys. Ah, you’re talking about the older Leaf. I should probably read the entire conversation before responding. Exactly how much details should Nissan have given you? They provided far more than the average considering a lot of manufacturers provide next to nothing. No, I didn't really mean say that, although I might have implied it (oops, re-reading I did say "will"). 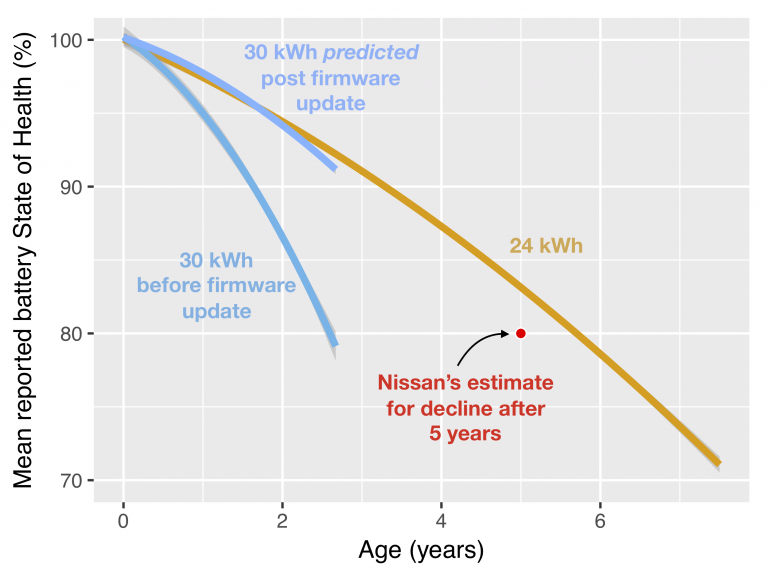 Right now, I personally don't trust Nissan's new batteries, or the firmware re-programming. It might be nothing, a minor blip, a major fail (with 50% degradation in 3 yrs), or a real error on the engineers/programmers part that has now been corrected. I really don't know or care since I'm not in the market for a new EV yet. However, if I were needing a new EV right now, and the Leaf was the only option, then I would ONLY lease, especially if I had a 70 mi RT commute in a hot climate (just like I recommended). I don't expect 50% degradation, but why purchase a potentially inferior battery (no temperature control) in 2018 when improved products will likely be available from multiple manufactures in 2020? Leasing now seems like the least risk, especially for the 2018 Leaf in a hot climate. Other EVs that have thermal management might also be a better choice, but some of those are regionally unavailable and/or more expensive than the 2018 Leaf. Even Gen 1 Volt with charging at both ends would come close to 100% EV miles. However, those options are for RonSwanson to evaluate. For what it’s worth after 2 years and 4 months since build date our 2016 SV has minimal loss. Then again we only have about 12k on the clock. A realistic range of mixed driving for us is still a solid 180 Km with some AC use. It may be different with higher mileage users but time doesn’t seem to play a big role for us. In our valley speed limits of over 90kmh are not common though and of course speed plays a big role. Only about 15 km of our weekend run is at 110 km/h. The rest is at or under 90 km/h. The odd time that we charge to 100 percent we still see around 200 Km on the GOM. webeleafowners wrote: For what it’s worth after 2 years and 4 months since build date our 2016 SV has minimal loss. What data is your conclusion based on ? I've grown partial to kwh used to charge up the battery, corrected for charging losses.